Britain’s top teenage doll was launched in September 1963 by Pedigree Toys Ltd, a division of the famous Lines Bros Ltd who had been in the toy business for over 100 years! In 2013 the Sindy brand celebrated 50 years of success with Sindy a role model, best friend and fashion icon to millions of young “Sindy Girls” over each of those years. The very first Sindy dolls had a full wardrobe of clothes and accessories which mirrored the latest young fashions and designers of the day. Our anniversary range was designed and developed to challenge and reflect today’s youth culture and the growing individuality of fashion it represents. The decade that launched Sindy was to see more revolution in fashion than any previous period before or since. For the first time clothes were aimed at teenagers as opposed to grown-ups and that is where Sindy excelled! Young 1960’s fashion had many extremes, one year mini’s (the shortest skirts in the history of fashion), only to be followed by midi’s (to mid-calf), maxis (to the ankle), then back to hot pants! Britain was then and remains now at the forefront of young international fashion, where Sindy is its obvious partner. 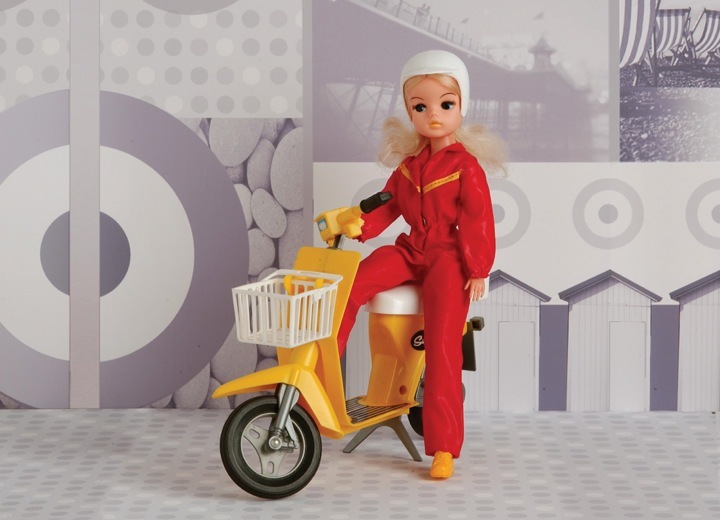 Sindy’s first range included her iconic ‘Weekender’ outfit supported by eight other themed dolls – Sleepy Time, Undie-World, Dream Date, Lunch Date, Skating Girl, Shopping-in-the-Rain, Pony Club and Country Walk. For her anniversary range Sindy had fourteen great new looks – Great British Sindy, Style Blogger, Shopping Spree, Festival Sindy, Ice Dancer, PJ Party, Sindy’s Got Talent, Pool Party, Garden Party, School Prom, Winter Fun, Country Life, Animal Print and Swinging 60s. All of her new outfits reflect ‘on trend’ high street fashions, aspirationally presented and themed to appeal to her latest generation of “Sindy Girls”. When Pedigree first launched its new 10 3/4” Fashion Doll Sindy, the design of the outfits was particularly important as every fashion detail had to be included. The well-known designers Tuffin & Foale, who were then as recognised as Mary Quant, were chosen to design Sindy’s extensive wardrobe, producing eight complete themed outfits and eight separates; miniaturised by Valerie Saunders, Pedigree’s head in-house designer. In the decade that followed Sindy was to have many more fashions and accessories as well as a boyfriend whose name was Paul, a little sister called Patch and friends Vicki, Mitzi, Poppet and Betsy. Sindy also acquired a scooter, beautiful bedroom furniture, a bath, camping set, horse and even an ironing board, iron, clothes horse, washing line and pegs! In 1968 Sindy’s fashion sense developed. She was no longer just the girl next door but increasingly a savvy, fashionable young girl with natural ‘film star’ looks and hair style. She was given rooted eyelashes and long silky hair (available in pale blonde, auburn and black), a twisting waist for easy movement and softer, bendable legs. In the 70’s a fantastic array of contrasting designs, fabrics and ‘Lovely Lively Sindy’ were introduced. Sindy’s face was further remodelled (whilst remaining true to her original sculpt), a fully posable body was introduced, which was jointed at the neck, shoulders, elbows, waist, hips and knees and was able to achieve any action pose; her glossy hair was given a centre parting, kept in place with a hairband and she even sported a slight tan! In 1975 a milestone in the production of Sindy was reached when Pedigree launched their best-selling doll ever – the fully jointed ‘Active Sindy’. In ballerina form this Sindy had fifteen joints, combined with a slightly updated and even more beautiful face paint. Sindy was to see many changes in the 1980’s most notably in 1986, when two new friends Mark and Marie came into her world. In the 1980’s she embraced all the fun and style of ‘Southfork’ from the hit show Dallas. She had her own house, a car, a fully equipped gym and an ice skating rink and in 1987 under Hasbro management her international expansion began apace, with a host of new and colourful dolls, clothing and accessories. The 90’s saw Sindy looking as beautiful, trendy and popular as ever, now styled to reflect Hasbro’s U.S. ambitions. Her 50th anniversary saw Sindy return to her roots focusing on youth fashion, now leaving “Fairy Tales” behind her. Much attention has been given to the design of the outfits and accessories, set off by one of her original sculpts, as presented in the 1970/80’s. This together with a fresh new face paint captures all of her original and natural beauty. Sindy’s original sculpt and face paint is unique, timeless and very special. Young, fresh, fun, innocent are words regularly used to describe Sindy. These are qualities often specified in the design of other dolls but rarely achieved. Somehow with Sindy it came together, with her classic sculpt universally recognised for its natural beauty. Sindy’s eyes look to her right, traditionally painted with large, black pupils including a white dot of light in each to enhance the deep blue irises. The result shows Sindy as a confident but not overly so young girl, a look which has endeared her to all, over the years. In 1963 no one could have predicted that over the next 50 years Sindy would become Britain’s best-selling, most loved, teenage fashion doll. Today’s anniversary Sindy is perhaps even more gorgeous than ever! Sindy originally could be bought with either pale blonde, auburn or black hair, traditionally styled with a centre parting. Her rooted eyelashes however were always black. Throughout the 70’s and early 80’s some subtle changes were made to both her face and hair and it’s this classic face that has been chosen for her anniversary range in 2013. Sindy’s new face paint brings the sculpt right up to date, giving her a stunning appearance complimented by a series of themed hair-play styles. Today’s Sindy embraces everything that made her number one fashion doll for all “Sindy Girls” throughout the world.